The Urban Land Institute has an interview with me today, where I chat through some of my friendly and supportive to developers when thinking about transit. how universal is transit’s geometry? Peter Parker of Melbourne on Transit makes a link between my serene sprawl post and the “Be on the Way” principle. It’s what I deserved, I suppose, for having written so much about how cul-de-sacs (at all scales, not just suburban) make attractive public transit impossible. My hotel here, the Elizabeth, turns out to be at the uphill end of a 700m long cul-de-sac. The entire thing is lined with 20-story buildings, mostly residential, that efficient public transit will never reach. Research by Lawrence Frank, Bombardier Chair in Sustainable Transportation at the University of British Columbia, looks at neighborhoods in King County, Washington: Residents in areas with the most interconnected streets travel 26% fewer vehicle miles than those in areas with many cul-de-sacs. Recent studies by Frank and others show that as a neighborhood’s overall walkability increases, so does the amount of walking and biking—while, per capita, air pollution and body mass index decrease. The Transport Politic tells the story of a new rapid transit corridor study in suburban Maryland, extending west from DC Metro’s Red Line terminus at Shady Grove. Don’t worry if you don’t know the geography. Think of this, instead, as a Rohrshach test. There’s a yellow option and a blue option, and the squiggly blue option has an additional optional squiggle in green. Which one would you rather ride? One of the problems with discussions of Transit-Oriented Development (TOD) is that the term sounds much too specialized. We hear talk of TODs as a special class of developments with special requirements and possibilities, and perhaps requiring special expertise. We often hear that a certain development is or isn’t aTOD, as though transit-orientation were not — as it obviously is — a matter of degree. Moreover, most of the urban development decisions that will determine the future viability of transit are not decisions about TODs. Most of them are not even conscious decisions about transit. The literature of “how to build TODs” is useless in these situations. 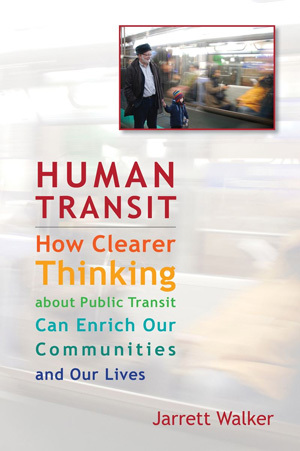 What people need are simple guidelines about transit that they can keep in the back of their minds, and on their checklists, as they plan ALL kinds of urban development. The same principles could help institutions and individuals decide where to locate.